MOSCOW (Sputnik) - The Kenya Red Cross Society (KRCS) said on Wednesday that the organization had no information on the whereabouts of 50 people who were staying at the Dusit Hotel in Nairobi, the site of a terrorist attack. "A total of 94 cases were reported missing as of 16th January 2019 at 1500 hours, 44 cases had been closed positively while 50 remain pending," the Kenya Red Cross Society (KRCS) said via Twitter. 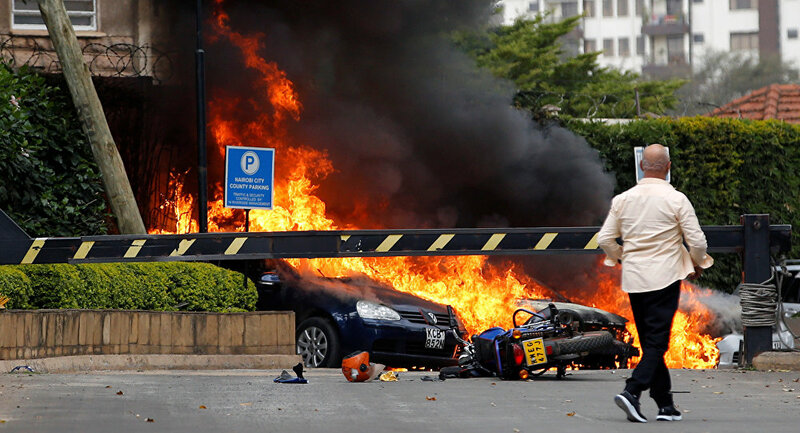 The attack took place on Tuesday when militants stormed the Dusit hotel complex in the Kenyan capital. The country's law enforcement agencies have categorized the assault as a terrorist attack. Kenyan President Uhuru Kenyatta said on Wednesday that the hotel attack had claimed the lives of 14 civilians and that all the attackers had been killed as a result of a special operation. READ MORE: One US Citizen Killed at Hotel Shooting in Kenya — US State Dept. Islamist militant group Al Shabaab, which operates mainly in neighboring Somalia, has claimed responsibility for the gun-and-bomb attack. One US national and one UK national are said to be among the victims.